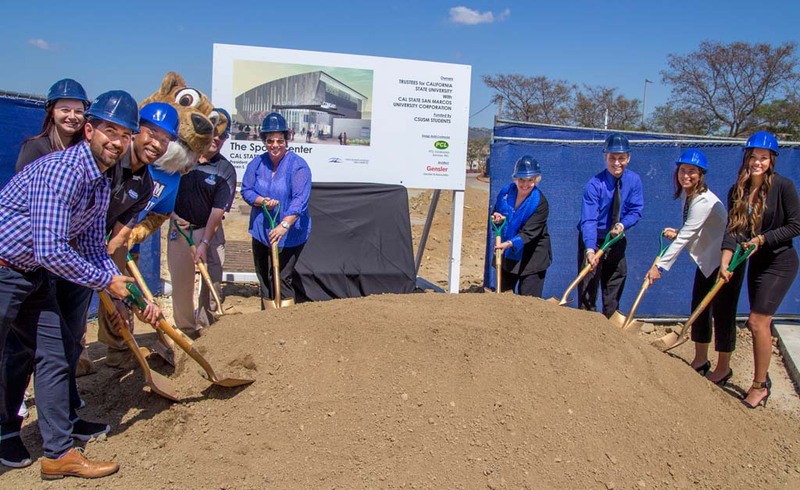 SAN MARCOS — Cal State San Marcos celebrated the ceremonial groundbreaking of its 2,200-seat on-campus arena this week. Athletics officials, school administrators and students hailed the forthcoming $11.4 million Cougar Sports Center as a huge achievement for the campus as it transitions from the National Association of Intercollegiate Athletics to the NCAA. Crews will complete construction by August 2016, in time for the 2016-17 women’s volleyball season. Cal State San Marcos’ court sport programs — volleyball and men’s and women’s basketball — have had a successful run in their four years of existence, including nine conference championships and an undefeated “home” record for the highly-touted men’s basketball team over the past two seasons. This success, however, has come with sacrifices for the nomadic teams, which play most of their games in front of sparsely attended crowds at local gymnasiums, including Pacific Ridge and Escondido high schools and MiraCosta College. Andrea Leonard, the head women’s volleyball coach, said the new arena would be transformative for the entire university community, both for morale and from a recruiting standpoint. “This will be our true home court advantage where our student population can easily arrive from class to cheer on their team, parents and families arriving with ease and our teams raising those championship banners to the sea of blue,” Leonard said. The arena is also a necessary step for the university to complete its transition to NCAA Division II athletics. The athletic programs will begin playing NCAA Division 2 schedule and are expected to fully transition to Division II by the 2017-18 school year. The 25,000-square-foot arena, which is being paid for primarily through student fees, will seat 1,400 for athletic events, but has a maximum capacity of 2,200 for other events. Cal State San Marcos President Karen Haynes likened the arena’s impact to the student community to that of the university student union and the health and counseling student services center, which have helped boost the school’s profile. The Sports Center, she said, has the potential to be a huge regional draw. For Harnett and other seniors, the new arena will arrive well after their departure from campus, but they plan on returning for its opening, and many other games to come.